A unique residency model gives artists a chance to advance their practice while volunteering their time in downtown Prince George, in northern British Columbia. The goal, according to program curator Justin Langlois, is to offer artists, who may have a socially conscious practice, an opportunity to apply their skills to directly help the community. 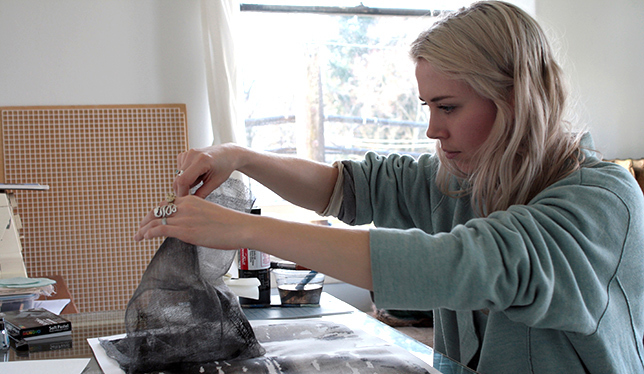 Artist Lily Mead Martin works on a project using a process developed during her residency. Photo by Caitlin Chaisson. From September to April, the Neighbourhood Time Exchange | Downtown Prince George offers artists a one-month residency in which they spend half their time in studio and the rest volunteering with a community partner. This “time banking” approach aims to cultivate a mutually beneficial relationship. In October, Vancouver’s Lily Mead Martin was paired with Two Rivers Gallery, where she used her carpentry skills to help with a re-decking project. She also found conversations with locals helped shape her studio work. “I was trying to figure out a way I could map this place as a visitor and as someone who’s really coming in essentially ignorant of a lot of these histories,” she says. 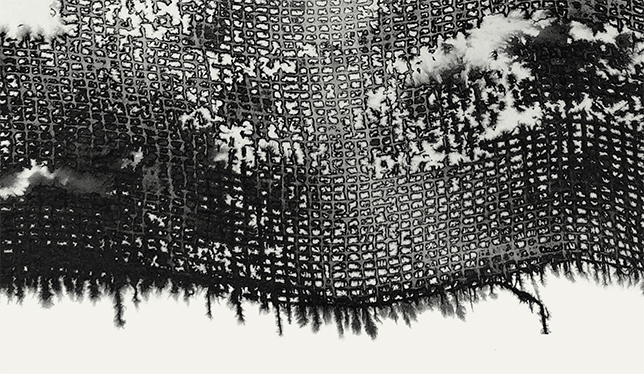 Lily Mead Martin created this piece made of fabric, ink and paper during her residency in Prince George, B.C. Photo by Lily Mead Martin. “We don’t insist on having community partners that are arts-focused because artists have a lot of really compelling skill sets to offer,” says Mr. Langlois, a faculty member with Emily Carr University of Art + Design’s social practice and community engagement minor. The residency is a partnership between Prince George’s downtown business improvement association and Living Labs at Emily Carr, which have also paired artists with a public library, an environmental organization and a community co-working space. Mr. Langlois first launched NTE in Philadelphia, where community partner Mural Arts helped him find funding through the National Endowment for the Arts. “The scale of the project is kind of unique in that it almost needs to set up its own infrastructure and really complex partnerships each time it happens,” he says.